The authors of this commentary are part of the leadership team for FREDLA (Family-Run Executive Director Leadership Association). FREDLA serves as the national representative and advocate for family-run organizations and their executive directors, and supports effective stewardship of family-run organizations focused on the well-being of children and youth with mental health, emotional or behavioral challenges and their families. Their perspective on priorities for future research reflects not only their appreciation of formal research literature, but also what they have learned through their work with family-run organizations and through connecting with family members and other caregivers around the country. Family involvement for children under age 18 is a long-held value and a cornerstone of the System of Care approach. In 1986 a guiding principle of The System of Care for children stated that "The families and surrogate families of children with emotional disturbances should be full participants in all aspects of the planning and delivery of services" (Stroul & Friedman, 1986, p. 17). From a system, clinical, and research perspective, family involvement is considered best practice (McLendon & Petr, 2008). However, when the young person reaches a specific age (18 in most states) they are considered an adult in the health care system. At this point, despite the recognition of the importance of family involvement, efforts to include families often come to a screeching halt. Major shifts in society have heightened the issue of transition and the changing role of family during this period. In their report on the National Longitudinal Transition Study, Newman et al. (2011) state that, "the growing struggles post-adolescents face in becoming economically self-sufficient elongate or postpone the transitions usually associated with adulthood" (p. 1). Recognizing this reality, a growing body of research is focusing on the period of "early adulthood," as distinct from adolescence and full adulthood (Arnett 2001; Settersten, Furstenberg, & Rumbaut, 2005). The 2014 National Survey on Drug Use and Health reported that among adults with any mental illness, young adults aged 18 to 25 were less likely to receive mental health services than adults aged 26 to 49 or adults aged 50 or older (34 vs. 44 or 50%, respectively; Center for Behavioral Statistics and Quality; CBHSQ, 2015a). When young adults were asked to identify one or more reasons why they did not receive the services they felt they needed, cost/insurance issues and the belief that getting services would cause them to experience discrimination were two of the main issues reported. Many young adults also named structural barriers to getting care, such as lack of transportation (CBHSQ, 2015b). According to the U.S. Census, more young adults were living with their parents in 2016 than was true in 1975 (Vespa, 2017). Economically, many young people are financially dependent upon their families for a longer period of time than in the past (Arnett, 2015). This trend, combined with the large numbers of young adults with behavioral health needs who do not access treatment, often puts families at the center of caring for them. Many family members report that they are the de facto case managers for their young person: arranging appointments, taking their young adult to the emergency department, or responding to a call from the police. Family members often mention their role in providing housing and note that they are the ones who help their young adult complete forms, such as college applications or job applications, and navigate complex systems of applying for health insurance or SSI. In many situations, family members are a major resource for their young person, both financially and in terms of emotional support and advice. Given this, it is perplexing that family members are not asked to contribute their expertise more often in supporting their young adult child. Most approaches to working with young adults with mental health challenges encourage independence and self-sufficiency, focusing on further education, stable employment, managing finances, and establishing personal relationships. Often these approaches give little attention to the strengths that families bring to the transition process. Many programs that work with young adults with mental health needs have no specific process for involving families in supporting their young adults, and some even consider families an impediment to the young adults' recovery and independence. HIPAA regulations are cited as the primary reason for not sharing information, as well as the right of the young adult to privacy and to make their own choices. While most families support their young adult being their own decision maker, families often find themselves faced with concerns about the young adult's ability to make decisions without support, to problem-solve without appropriate information, and to follow-through on completion of tasks. As youth transition to adulthood, family members often find themselves navigating a changing landscape. The roles of the family member evolve during the transition years, just as the role of the young adult does. Family members have been the primary decision makers for their child for 18 years. Suddenly, as their young person turns a certain age (18 in most states), the family role changes abruptly with the young adult now making all of the decisions—whether they are ready to or not. There is a critical need for the field to develop guidance regarding family involvement during the transition years. Because there is a general lack of research about the benefits of involving family members, there is also little in the way of recognized best practices. The approaches most often utilized with this age group do not emphasize family involvement as a key component of treatment but do not exclude it either. Families should be viewed as a potential resource for the young adult and an asset to treatment with knowledge and history of the young adult's journey. While HIPAA is an important consideration, it is not and should not be a barrier to involving families. Authorization forms, signed by the young adult, allow family members to be informed and offer support. It does not appear that authorization to include family members is routinely discussed with young adults. It is important that the service system recognize that family members also need support and information during the transition years. Parent peer support, family-run, and advocacy organizations have been shown to be valuable resources for families of young adults. The National Longitudinal Transition Study found that more than half (63%) of the respondents reported they had gotten information about transition from adolescence to adulthood from an advocacy organization (Newman et al., 2011). Connecting with another parent or caregiver who has similar life experiences can make a difference in helping the parent learn to effectively support their young adult while respecting their autonomy and decision making authority. Transition isn't easy for the young adult or the family. By supporting both, the chances for positive outcomes can be increased. The lack of research about the benefits of family involvement for young adults with mental health needs is a major barrier to moving forward. FREDLA (Family Run Executive Directors Leadership Association) has undertaken an initiative to examine the issue from multiple perspectives, develop guidance for the field, and highlight the importance of family involvement in services and supports for young adults. FREDLA has reviewed current approaches to treatment, and recently hosted an expert convening on this topic with researchers, family and youth leaders, and policy makers. The expert convening provided an opportunity to discuss what is known about successful programing approaches for young adults of transition age and to identify opportunities for integrating family involvement into current practice. The individuals present explored the strategies and skills needed to improve the way that service providers relate to, engage, and partner with family members when working with young adults. When the results of the expert convening become available, they will provide a starting point for setting a research agenda for this important topic. Other next steps could include a comprehensive review of literature on family involvement with young adults who have diverse disabilities and medical conditions, surveys of family-run organizations and youth organizations, providers, and family members whose young person has transitioned. There is limited research about the impact of family involvement on transition into adulthood for young adults who have mental health needs. Research must be conducted that will identify the most effective ways to involve families appropriately in the transition process. Research must also be conducted to document the impact of family involvement on the outcomes of young adults as they move into adulthood. Information gathered through the initiative undertaken by FREDLA will continue to inform the development of best practice principles and guidelines to support the changes that are needed. Arnett, J.J. (2001). Conceptions of the transition to adulthood: Perspectives from adolescence through midlife. Journal of Adult Development, 8(2), 133-143. Arnett, J.J. (2015). Emerging adulthood: The winding road from the late teens through the twenties. New York, NY: Oxford University Press. Newman, L., Wagner, M., Knokey, A.-M., Marder, C., Nagle, K., Shaver, D., ... Schwarting, M. (2011). The post-high school outcomes of young adults with disabilities up to 8 years after high school. A report from the National Longitudinal Transition Study-2 (NLTS2) (NCSER 2011-3005). Menlo Park, CA: SRI International. Settersten, R.A., Furstenberg, F.F., & Rambaut, R.G. (2005). On the frontier of adulthood: Theory, research, and public policy. Chicago, IL: University of Chicago Press. Stroul, B., & Friedman, R. (1986). A system of care for children and youth with severe emotional disturbances (rev. ed.). Washington, DC: Georgetown University Child Development Center, National Technical Assistance Center for Children's Mental Health. Walker, J., & Pearson, M. (2018). 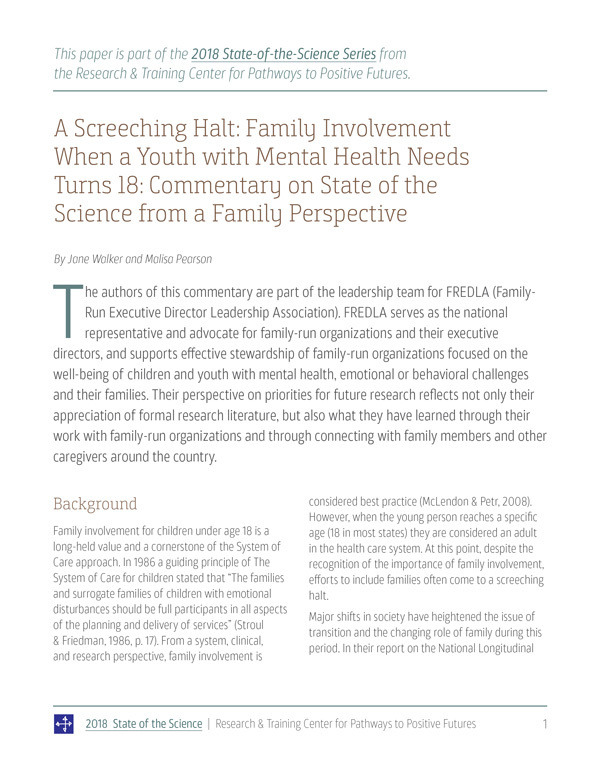 A Screeching Halt: Family Involvement When a Youth with Mental Health Needs Turns 18: Commentary on State of the Science from a Family Perspective. Portland, OR: Research and Training Center for Pathways to Positive Futures, Portland State University.